In addition to year-round Fireworks sales and delivery across Canada from our warehouse in Toronto, Ontario and seasonal Fireworks sales at our Barrie-Area superstore (open 5 months per year), ROCKET Fireworks opens temporary retail outlets each year for Victoria Day, Canada Day, Diwali Fireworks and New Year's Fireworks. For Victoria Day and Canada Day,, we will have 15 locations open in Toronto, Southern Ontario and the Ottawa area. w Our goal is to provide you with expert, personal attention, working within your budget and preferences to create your perfect Family Fireworks Display! Experience the largest selection of retail Fireworks in Canada - with amazing discounts and deals! Order Fireworks Online: we offer convenient Online Shopping and door-to-door Fireworks Delivery across Canada 365 days a year! Ordering Online is fast, easy and fun; and superb customer service is guaranteed! If you prefer to place your order by Phone or Fax then please feel free to do so: it will be our pleasure to consult with you however you choose. Blowout Fireworks Sales and Deals! We are open to the public year-round, offering convenient, hands-on access to our vast fireworks inventory--with everyday discounts and blowout specials on the biggest and best Fireworks in Canada! Rocket.ca retail fireworks stores are located in the following areas: Fireworks Toronto, Fireworks North York, Fireworks East York, Fireworks Etobicoke, Fireworks Newmarket, Fireworks Keswick, Fireworks Whitby, Fireworks Markham, Fireworks Thornhill, Fireworks Ottawa, Fireworks Cambridge, Fireworks London, Fireworks Mississauga, Fireworks Oakville. Fireworks Events: Please see our Fireworks Toronto page for a List of upcoming Displays in the Toronto area. SHOPPING IN-STORE? Please feel free to fill out an Order Form in advance. 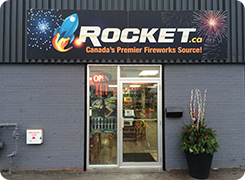 ROCKET FIREWORKS INC. is headquartered in Toronto, Ontario, Canada and operates Retail Fireworks Stores, Trailer Locations and Discount Outlets throughout Southern Ontario. Prefer to order Fireworks online? We provide year round, door-to-door delivery to Canadians coast-to-coast!